A reliable source for Cyclone Dust Collectors information and a resource for accessing leading Cyclone Dust Collectors and suppliers. Cyclone dust collectors are ideal for abrasive large particle dust collection tasks that would stress standard filter media. For this reason they are often used as pre-filtering modules for bag houses and cartridge collectors. Cyclone dust collectors serve industries such as ore processing, pharmaceutical, cement fabrication, metal fabrication, mining, chemical processing, recycling and agricultural industries. Cyclone Dust Collectors Cyclone dust collectors are ideal for abrasive large particle dust collection tasks that would stress standard filter media. For this reason they are often used as pre-filtering modules for bag houses and cartridge collectors. Cyclone dust collectors are cylindrically-shaped inertial separators that use centrifugal air movement within a hopper-shaped chamber to separate particles from the air. Cyclone separators have an involute entry, meaning the dirty air enters via a spiral, and clean air exits through a counterflow, coaxial clean air outlet. Once the contaminated gases enter the dust collector the particles, being heavier than air molecules, are thrown against the outer wall of the hopper by the centrifugal force caused by the rapid spiral motion of the inner helix and fall to the bottom, where they are collected. The inner helix is driven by an electric motor mounted on the top or the bottom of the cyclone dust collector. 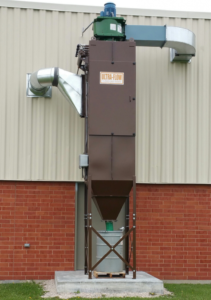 While the dirt is collected at the bottom, clean air moves upward through the cyclone outlet and is blown outward through the blower outlet. Multi-cyclone dust collectors are also available, consisting of a numerous small diameter cones set-up parallel to one another with vane spinners. These cones have a common air inlet and outlet and are generally longer than single-cyclone dust collectors, making them more efficient. Both single-cyclone and multi-cyclone dust collector designs are common. Cyclone dust collectors are available in a wide range of sizes and configurations for increased efficiency for different applications, from massive multi-cyclone outdoor collectors designed for the cement industry to "lab-scale" mobile cyclone dust collectors designed for use in pharmaceutical pill and tablet manufacturing. Whatever the precise application, cyclone dust collecting systems can used to help ensure worker health and equipment longevity.